Nigeria! Good People! Great Nation! and $1.8 Million Logo!Bellow the most expensive marketing logo in the world! General Olusegun Obasonjo: A Monster as Statesman! Sometime in the evening of Wednesday, March 18, 2009, at the Sheikh Zayed Theatre, New Academic Building of the London School of Economics, London , England the crème de la crème of the international community will once again be gathered to listen to the ostensible wisdom of an African statesman. But this man, General Olusegun Obasanjo, Nigeria ’s former president and presently the UN Secretary-General’s peace envoy in the Congo is no statesman. He’s an animal called man, a corrupt and treacherous monster soaked deep in the blood of innocent Nigerians. As a human being, Obasanjo has had some of the rarest opportunities in public service anybody could get anywhere, which ordinarily should have been a springboard for great things were he someone with an iota of humanity or decency. After a total of eleven years as the head of state and president of Nigeria , the man is only remembered today in Nigeria as a crude, corrupt, lecherous and bloodthirsty tyrant who masqueraded as a democrat and sought at all cost to always impose his perverse will on the nation, even where it is clearly detrimental to national interest. Before May 1999 when Obasanjo was sworn in as the civilian president of Nigeria , he has had a history of public service at the highest level also as a military head of state between 1976 and 1979. His singular act of handing over government to an elected civilian government in October 1979 was seemingly enough for Nigerians and the international community to forgive him of his atrocities as military head of state. Some of those atrocities include the setting up of the notorious secret detention centre in the island of Ita-Oko, the killing of Nigerian university students in cold blood and the invasion and razing of the home and business premises of Fela Anikulapo-Kuti, the late iconic Nigerian musician who was an ardent critic of his military government. Obasanjo transmutation into a pretend statesman after his military career saw him set up the African Leadership Forum at Ota , Nigeria from where he talked glibly about democratic reform in Africa . But when in 1993, he was presented with an opportunity to back up his talk with action with the June 12 elections, he, not for the first time, shocked the nation with his support for the annulment of the election. He viciously attacked Chief MKO Abiola, the man elected president in the election, despite the fact that the national and international communities overwhelmingly declared the election the freest and fairest in Nigeria ’s history. In open desperation, Obasanjo was soon in cahoots with his military friends setting up all sorts of anti-democratic political contraptions to negate the people’s mandate. Obasanjo and his military friends presided over the succeeding locust years until he fell out of favour with General Sani Abacha, the then head of the military junta who jailed him on coup-plotting charges against his government in 1995. This act by the odious Abacha invariably rehabilitated Obasanjo in the eyes of Nigerians and the international community as efforts were made to first commute the sentence passed on him and then get him out of jail. Thus, in June 2008, as Obasanjo walked out of prison preaching Christ and publishing a book titled, This Animal Called Man (a psycho-analytical study of the nature of human-induced evil from the Christian perspective), Nigerians and the international community felt he’d finally learnt his lessons and found God. No sooner after he was rewarded with the presidency of the country in May 1999, he began once again to show his true colour as a wolf in sheep’s clothing. Seven months after taking over as civilian president, Obasanjo ordered the military invasion of a community in the Niger-Delta in a vain attempt to send the message to the creeks that his government would not tolerate any agitation for fair distribution of the oil wealth or responsible exploitation of the valuable resource in the area. Obasanjo’s army razed the whole town of Odi to the ground and killed everyone in sight. The massacre had the world in outrage; but, typically, Obasanjo ignored the cries. Just to make sure the message was heard loud and clear, Obasanjo followed up with more massacres in Choba, Igwuruta, Biogbolo and other places in the Niger-Delta. By these actions, he succeeded in transforming the essentially non-violent agitation for equity, justice and fairness in the region into a full-blown war needing the permanent location of a huge military task force in the area, perennial attacks against communities and running battles between the soldiers and the militants, some of whom are the same criminal elements Obasanjo armed to intimidate his political opponents and rig elections for his party, the PDP. It is in this light we must see last year’s visit of President Umaru Yar’Adua who came to ask Downing Street for military assistance to fight the militants, indicating how escalated the problem has now become. The world may not know it, but the seeds of the present crisis were firmly sown by Obasanjo. Less than two years after Odi, between Monday October 22 to Wednesday October 24, 2001, Obasanjo repeated the same atrocity in the central Nigerian state of Benue where he sent in his murderous soldiers to kill and burn down the communities of Zaki Biam, Vaase, Agbayin, Gbeji, Sankara and several others ostensibly for the killing of some soldiers. Amnesty International described what happened there as “a killing spree” and appropriately advised that rather than seeking to deny, minimize or justify these extrajudicial executions, “the government of Nigeria must...condemn the killings publicly and make it clear that those responsible will be held accountable”. When the Human Rights Watch wrote its report on the massacres, Obasanjo boasted that he “dismissed the report with the contempt it deserves”. He went on in an interview with the Financial Times of April 9, 2002 to justify sending the soldiers on that mission and supported their action by declaring that when you send in soldiers, “they do not go on a picnic”, proclaiming that “in human nature, reaction is always more than the action”. A few weeks after the killings, Obasanjo was being welcomed by President George W Bush in the White House. At a joint press conference in the Rose Garden, Obasanjo unashamedly defended his actions before a shocked world. From Kano to Kaduna to Jos, Obasanjo’s tenure witnessed the bloodiest peacetime inter-communal clashes in Nigeria . As strong suspicions grew that these clashes were instigated mainly by members of the new political class, especially top members of Obasanjo-led PDP, Obasanjo himself came out to claim he knew those sponsoring the mayhem. But the nation waited forlornly and hopelessly for him to name or institute prosecution against these people. Despite the thousands of lives senselessly lost in these carnages, not one single person has been prosecuted or convicted. Barely three years into his first 4-year tenure, Obasanjo was asked how he felt about the fact that more than 10,000 Nigerians have lost their lives through these politically instigated communal clashes on CNN (aired September 17, 2002) and his response was to imply that 10,000 people dying in a population of over 120 million shouldn’t be a big deal! 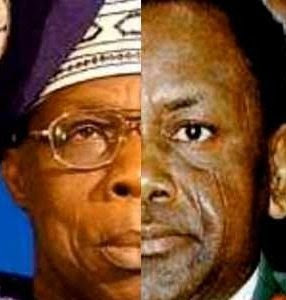 While political assassination perforated the reign of General Sani Abacha and largely accounted for the contempt in which he was held worldwide, Obasanjo surpassed the morbid record of the Goggled One in this regard, not only by the sheer number or the manner of their death, but also in the calibre of people that were assassinated. Still western leaders were falling over themselves to welcome him to their capitals, making him a fixture in high level conferences discussing African developmental needs. Two days before Christmas in 2001, Bola Ige, a political rival to Obasanjo but at the time an uneasy ally, who held the important portfolio of Attorney-General and Minister of Justice in Obasanjo’s cabinet, was gunned down in broad daylight in his own home in Ibadan, Oyo State, Nigeria. In a macabre dance of the absurd, Ige’s death was played out in the full glare of the nation. But his blood was still warm when Obasanjo and his party rewarded those strongly suspected of his murder with political power. On March 5, 2003, Dr Marshall Harry, who used to belong to Obasanjo’s party, but who defected to the All Nigeria People’s Party (ANPP) and posed a great obstacle to Obasanjo’s agenda in the South-south region as vice chairman of his new party kissed the dust. The man was murdered in his own home in Abuja in circumstances that suggested the involvement of highly trained assassins with military background. The killers stayed for almost two hours in the house trying to get the man, who at a point came out on his balcony to cry for help while the men battered his reinforced door and cut through his ceiling. His house was just a few meters from the Police Command of the Federal Capital Territory , yet no help came. On Feb 6, 2004, Harry’s kinsman, Aminosoari .Dikibo, a national vice chairman of Obasanjo’s party was shot dead on his way to a zonal meeting of his party in Asaba. At the time, he belonged to a rival faction to Obasanjo within the party, was seriously opposed to his meddling in Anambra State and openly supported the Obasanjo-embattled Chris Ngige. Two days after the man’s death, before the police could say anything, Obasanjo peremptorily informed the nation that Dikibo was killed by armed-robbers. This was despite the fact that those who killed the man on the road did not take any valuable or money from him. Of course, Obasanjo’s claim was met with national uproar and suspicion. How did he know Dikibo was killed by armed-robbers that soon when the police were yet to come up with anything? Why is he pointing to that direction if not to divert attention from the real source(s) of the man’s death? Like Ige and Harry, Funsho Williams, PDP’s front-runner for the Lagos State governorship slot met his death in the hands of daring assassins in his own home on July 27, 2006. They came in, tied him up, brutalized, stabbed and strangled him. Apart from the above, we had the cases of Alabi Hassan-Olajokun, a financier of the Alliance for Democracy in the western states; Dr Ayodeji Daramola, a governorship aspirant in Ekiti State; the activist pilot, Jerry Agbeyegbe; the fiery journalist, Godwin Agbroko; Andrew Agom, a member of the PDP Board of Trustees; Jesse Aruku, a governorship aspirant in Plateau State; Ahmed Pategi, PDP Chairman in Kwara State, Ogbonnaya Uche, ANPP senatorial candidate for Orlu and many more. In all these cases, the killers made sure they left no one in doubt that these were political murders meant to send a message to certain other elements within the system committed to serious democratic party politics. Indeed, there are those who believe the murders were not unconnected with Obasanjo’s self-perpetuation agenda, as, by this time, his pet “Third Term” project was already in full swing. Curiously, since his Third Term plan was shot down by Nigerians, the political assassinations have stopped as well. Needless to say, these murders remain unresolved till this day. Prof Wole Soyinka, the Nobel Laureate said it best when he described Obasanjo-led PDP as “a nest of killers”. Not surprisingly, such a regime couldn’t have been sustained without massive corruption, which he spearheaded even as president. Obasanjo’s way of fighting democratic battles within the National Assembly was through massive bribery. For instance, when in 2002, there was uproar for his impeachment following the massacres at Odi, Zaki Biam and so on (amongst 16 other charges), he used money to buy over the legislators and made sure they didn’t get the needed numbers. At one point, Obasanjo’s bribe money was displayed on the floor of the National Assembly publicly. Indeed, Obasanjo’s well-known corrupt dealings are legion and it would be a boldfaced lie for those who parade him within the international community today as a worthy statesman to claim they have no idea. The series of revelations of the huge corrupt dealings that pervaded the comatose power sector throughout Obasanjo’s tenure have his imprints all over them. In March 2008, the National Assembly indicted him for supposedly spending $2.2 billion on power without due process. The Transcorp shares, the Obasanjo Library Fund, the COJA contracts, the PTDF scandal, the Siemens bribe scandal, the oil contracts and oil wells allocation done directly by Obasanjo who also doubled as Petroleum Resources minister are all tips of the iceberg. Obasanjo ran Nigeria aground and, when it was obvious to him that his Third Term bid has failed, he vengefully imposed on the nation the seriously sick brother of his late friend, Shehu Musa Yar’Adua as president. 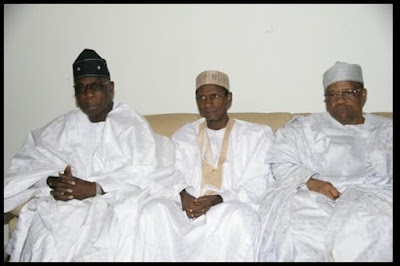 For Obasanjo, Umaru Yar’Adua is the pliable tool he needed to make his getaway. He ensured that the election that brought him in was the worst in the nation’s history. He introduced the principle of “do or die” politics and used the security forces and the Economic and Financial Crimes Commission (EFCC) to intimidate anyone in the way of his designs. Indeed, he personally supervised the maiming, killing and sheer robbery that ensured Yar’Adua was put there. Nigerians today still groan under Obasanjo’s dastard legacy. The term ‘failed leader’ cannot begin to do justice enough to his legacy, yet those who direct affairs of the international community continue to embrace him as some kind of African messiah, pushing him in the forefront of anything Africa. Today, they have inflicted him on the Congo – a man whose legacy of death, mayhem and spectacular failure has knocked Nigeria into comatose is being depended on to provide a pathway to peace in the Congo ! Talk about pie in the flaming sky! The United Nations Secretary General Ban Ki-Moon and the international community who are entrusting Obasanjo with the task of bringing peace to the Congo are perhaps seduced by his glib talk. They probably think as one of the oldest and longest serving former ruler of an important African country and a former military leader who as a young officer served in Congo , he would command more respect from the warring factions there. Well, all they need to jolt them to reality is to think of Liberia . Obasanjo’s policies in Liberia made things worse by enabling his genocidal friend, Charles Taylor, who, when the international community finally decided enough was enough, found refuge in Obasanjo’s abode. The man had to be virtually prised away from his hands to stand trial for crimes against humanity. No one should be surprised. What bind them are not only cheap Liberian women, they are kindred spirits who hunt and kill innocents together! Lastly, it’s important that the world should get an idea of the kind of father Obasanjo is. Just as Nigerians ushered in the New Year in 2008, they were greeted with the shocking and debasing news that Gbenga Obasanjo, the ex-president’s own son, has accused his father of having sexual relations with his wife, Mojishola Obasanjo. The younger Obasanjo was stating this in court papers, asking for the dissolution of the marriage. A nonplussed nation waited for general Obasanjo to deny this publicly. He didn’t, neither did the lady. Gbenga insisted: “I know for a fact that my father had sexual relationship with Moji due to her greed to curry favour and contracts from him in his capacity as President of the Federal Republic of Nigeria.” The divorce was granted on those grounds and its now there in public record that General Olusegun Obasanjo, who has a reputation as a lecherous man of insatiable sexual appetite, slept with his son’s wife! The Nigeria Liberty Forum considers it a public duty to stop people like Obasanjo representing Africa anywhere, because he represents the same failed face of Africa . We cannot afford for different versions of Mobutu, Idi Amin, Bokassa, Conteh, Marcias Nguema and their ilk representing us at a time the world is yearning for genuine leadership. Obasanjo has the traits of the worst tyrants in Africa , but he seems to have the international community under his spell. They overlook his indiscretions and scandalous crimes and shower him with credibility when he should be cooling his heels in jail or hiding away in one remote corner of the world, far, far from civilization! Not too curiously, the increasingly retrogressive authorities of the London School of Economics have equally fallen under his spell. They have since revoked all accreditations given to press men for the event and have requested that the Nigeria Liberty Forum pass whatever message it has through them to Obasanjo, all in an attempt to keep the public away. Well, it’s not going to happen, because the world must know who Obasanjo is. We can speak for ourselves in any public space and we can do so via a peaceful protest. Obasanjo is a monster not a statesman and no amount of lipstick or make-up will change him from who he is. We know him and every decent citizen of our world needs to know him for who he truly is as well. Long Live the Federal Republic of Nigeria ! London School of Economics. Freedom for a DICTATOR! Gagging the PUBLIC! Evil Men Holding Nigeria to Ransom. From Left of Picture Olusegun Obasonjo indicted for high level corruption by the Nigerian Law Making body. Umaru Musa Yaradua. Puppet President of Nigeria rigged into office By Obasonjo to cover up his corrupt practices. Yaraduas Election was described as the "worst in the history of democratic election"
Anti General Obasonjo and misconduct in Nigeria Protest Event. 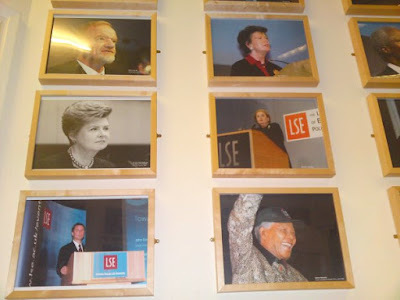 VENUE: London School of Economics. 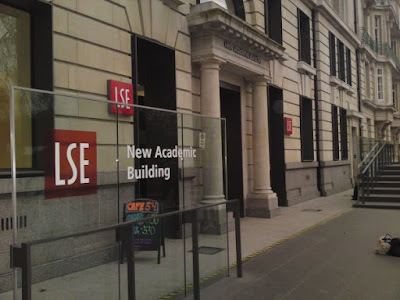 New Academic Building.54 Lincolyn Inn Fields. London. WC2A 3LJ. Piccadilly line on London Underground. Come out of the Hoborn Station. Turn left ask anyone for the LSE and at the LSE ask for the "NEW ACADEMIC BUILDING" APX 5 minutes walk from station. How do I make it to the anti Olusegun Obasonjo London Protest? The Liberty Forum UK will be attending an event hosting General Olusegun Obasonjo, former Nigerian ruler at the London School of Economics. We shall be registering our protest in a very civil manner as guaranteed by the laws of the United Kingdom. Our aim is to continue out tradition of making the United Kingdom uncomfortable for Nigerian Corrupt misrule’s as we did against President Musa Yaradua last year. See link bellow. We believe Obasonjo is not worthy of the statesman status he his now enjoying, we shall in due course be releasing statements chronicling the grounds the international community should not honour a corrupt man who left Nigeria in the hands of his fellow corrupt ruling cabal in Nigeria and a clueless President rigged into office under the joint supervision of Obasonjo and Professor Iwu. HOW DO I ATTEND THE LECTURE? CLICK ON THE LONDON SCHOOL ECONOMICS WEBSITE BELLOW AND FOLLOW THE LINKS THAT ALLOW YOU TO REGISTER AND GET A FREE TICKET TO EVENT VENUE. Registration starts from 9th March. This event is free and open to all however a ticket is required. One ticket per person can be requested from 10.00am on Monday 9 March. Members of the public, LSE staff and alumni can request one ticket via the online ticket request form which will be live on the London School of Economics web listing from 10.00am on Monday 9 March. HOW DO I GET TO VENUE OF EVENT? Date: Wednesday 18 March 2009Time: 6.00-8pmVenue: Sheikh Zayed Theatre, New Academic Building. Waterloo - other side of the River from the Strand over Waterloo Bridge. Approximately a 10-15 minutes walk. Trains to and from the south coast and south west of England. Charing Cross - on the Strand at the Trafalgar Square end. Approximately a ten-minute walk. Trains mainly to southeast London and into Kent. Blackfriars - on the Embankment near Blackfriars Bridge. Approximately 10 -15 minutes walk. Trains mainly to south London and south east England but also the First Capital Connect line through north London. St Pancras International - on Euston Road, close to King's Cross mainline station. Take the Piccadilly Line from King's Cross-to Holborn; from where it is a five minute walk (see 'Holborn' above). Serves the Eurostar and trains to the Midlands. Each bus stop should show which buses stop there and their frequency. On the front of the bus the final destination will be given. It may also show the names of the main stops on its route. The Liberty Forum will be making available flyers and placards at the venue but you are advised to bring home made flyers and placards. We shall do everything within the laws of United Kingdom to make the voice of Nigerian’s oppressed by Obasonjo and his colleagues in Nigeria heard in far away UK.